Getting the best blog WordPress theme is the most exciting part when launching a new blog, whether you would like to admit it or not. WordPress is the popular platform that is widely used content management systems. And, the best part is that nearly one-third of all websites on the internet today are built on WordPress. As WordPress is of zero cost and open source structure, everyone from professional news organizations to the humble home blogger is using WordPress to manage our content. Nowadays, you can find many amazing blog themes that will help you to express your point of view through writing a blog. As a blogger, you put your heart and soul into creating beautifully crafted posts, eye-catching images, and attractive leads which is a lot of hard work. Not only that your blog website will represent your ideas and ambitions that will directly attract and entertain a steady flow of followers. And also, a well-designed blog theme can improve your site’s visual appeal and make it easier for your viewership to navigate through your website. Specifically, the blog themes are designed in a way that will cater to the needs of bloggers and draw attention to the blog posts. Hestia Pro is a premium blog WordPress Theme that is designed beautifully. This theme comes with unique, powerful and responsive mega menus that easily arrange and organize submenu content. It is fully responsive theme that looks awesome on all the screen sizes equally. You can easily customize your site the way you like with the live preview. Perth Pro is a premium WordPress blog theme that is perfect for companies and freelancers. This theme comes with a crelly slider and extra templates and widgets. It is highly customizable with many new options available in the customizer. Also, the theme contains live customizer which allows you to view previews of all the changes you made. The theme also supports video header option where you can post a video in the header. Aesthetic is a fully responsive WordPress blog theme that comes with many amazing features. This theme has all of the great options for bloggers to make your website look more stylish and attractive. Also, the theme is very customizable and easy-to-use that makes your website beautiful. Suarez is a stunning blog WordPress theme that is built with bloggers in mind, precisely designed and correctly coded. This theme is the perfect combination of a beautiful and modern design with tonnes of powerful features and a professionally written code base. It’s loaded with nice features to attract and retain your readers. Discussion is a perfect blog WordPress theme for discussion and blogging. This theme is comes with attractive layouts that is suitable for the WordPress Tutorial sites. It is a theme that is suitable for smart bloggers. All the pages, posts, and contents are designed on a notice board using push pin and sheets. You may like the stylish design. And, you can make your site for selling your products easily. Street Style is a premium blog WordPress theme ideal for building awesome looking website. Starting a beauty or fashion blog with a unique angle can be tough in the competitive online world. This theme comes with amazing features like clean code, fast page loading, built-in SEO tools, and exclusive Nimbus shortcodes too. Charm is a premium blog WordPress theme that helps you to build an awesome website easily. This theme is fully-loaded with 580+ font based icons for easy addition of social icons. It is fully responsive theme and well op[timized theme. The theme is compatible with all the major browsers that are well tested. and six home page layouts. It includes unlimited colors options so, choose the color of your choice on your site perfectly. If there wil be any difficulty while installing the theme then, the documentation will help you out. Connect Pro is an elegant, clean and modern blogging WordPress theme. The theme is made to focus on beautiful simplicity, let you share your awesome content. It is completely responsive and looks perfectly in all mobile devices. This theme makes your article look very professional even with only a small number of content. 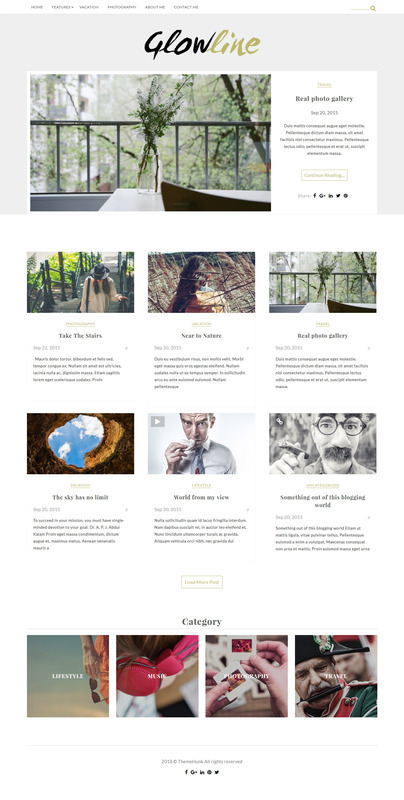 Olsen is a brilliant-premium WordPress blog theme. This theme is translation ready so you can choose any language and design your website easily. It is specially crafted for lifestyle and fashion bloggers that guarantees the smoothest reading experience for the users. It offers highly customized widgets that makes a user more engaging into the site. The theme features two menu location, one on the header and another on the footer. Bloog Pro is a feature-rich premium WordPress blog theme that is designed and developed focusing each and every necessity to craft a perfect blogging site. It is an elegantly designed theme ideal for personal blogs, company or organization blog websites. Besides, it is also fine for news-magazine and review publishing sites. For the professional bloggers and those who want to have a successful online presence by promoting their great content, this theme is the right choice. Bridge is a creative premium multipurpose WordPress theme that comes with 200+ complete demos for quick and easy website creation. It is loaded with innovative and highly useful features and functionalities. The theme includes 500+ useful shortcodes and customization options. It comes with unlimited header and menu layouts and more than 700 webs optimized Google fonts. Give your website your desired look. Pixeldom is a user-friendly WordPress blog theme that focuses on delivering an easy user experience to your visitors and reduce bounce rate which increases your Ad revenue. Its superb Ad placements maximize your revenue from banner ads or Adsense by boosting your Click-through rate. The theme is best optimized to boost your CTR and give you the best user experience and usability. Schema is a pixel perfect WordPress blog theme with custom options panel. It is an easy-to-use theme with lots of exciting features, clean shortcodes, and widgets. You can fully customize the theme, add widgets of your choice and promote your website in your own way. Your site’s ranking is not a problem with this theme as it includes rich snippets and follows the best SEO practice to place you in a higher position. Troy is a quality Premium WordPress Blog Theme with great features and stylish modern design. It offers you lots of customization possibilities and allows you to set special settings for your various posts,page and more to personalize your website and make it different and better than others. The theme is well compatible with the latest WordPress version, so your website is also updated whenever WordPress is updated. Riba is a stunning premium WordPress blog theme with responsive and retina ready layout. It offers worthy blog template, that enables you to record your stories, experiences and opinions in an easy way and with a good impression on website visitors. It showcases your posts and articles in a unique style with mesmerizing parallax effect. 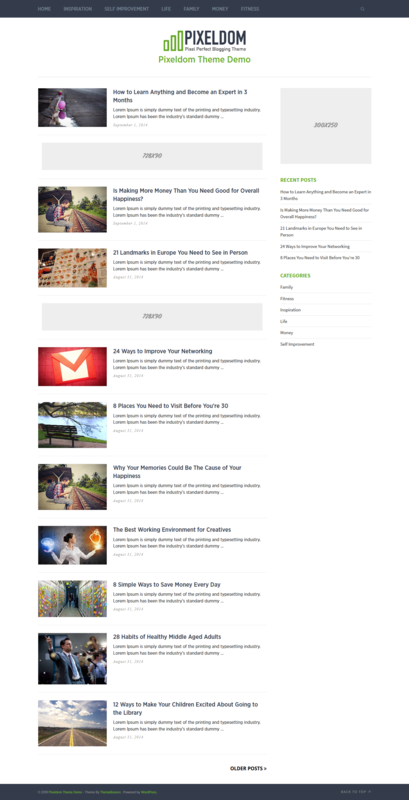 HowTo is a stunning premium blog WordPress theme perfect for content heavy blogs. It includes beautiful homepage layouts, responsive design, navigation, and readability optimization to give your customer an amazing reading experience. It comes with an options panel that allows you to easily customize your theme as per your need. It has got the parallax scrolling effect that provides an eye-popping sense of depth for a better impression. 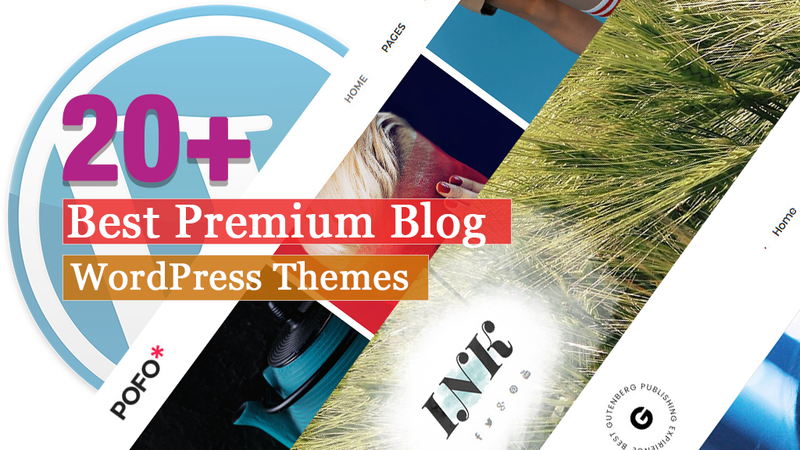 Ink is an incredible premium magazine, blog WordPress theme with well-organized layouts perfect for any magazine website or personal blog. It comes with multiple layouts and creative design to display your content beautifully that is loved by everyone. This exciting theme includes a stylish homepage with 4 premade demos which let you create a stunning complete website easily as per your wish. Rima is a modern and stylish blog WordPress theme that can give your readers immersive browsing experience. This theme is polished and beautifully balanced pages make it an ideal WordPress template for almost all types of blog. You will get the support and updates with this theme that will let you design your site perfectly. The Blog is an awesome blog WordPress theme that is designed beautifully. This theme is powerful for blogging and any website, packed with awesome features and simple to use. With the help of this theme, posts will be styled according to the category attached, but you can also style the post individually. And the theme includes unlimited colors and options to make your site more attarctive. 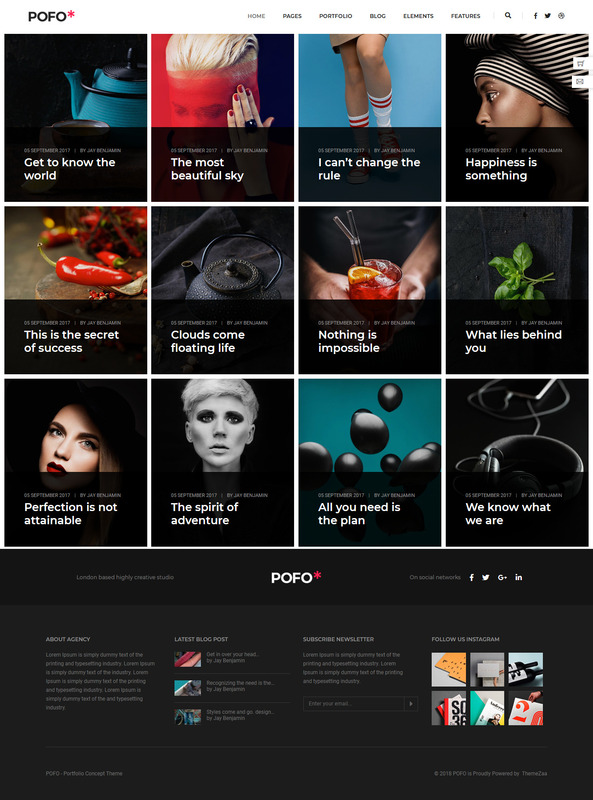 Pofo is an outstanding blog WordPress theme that is perfect to build a beautiful blog website. This theme includes the feature one-click demo import that lets you create a site just like the demo with just a click. You can modify many elements of your site by simply clicking on the element you wish to modify and updating it. This allows you to make changes fast, see those changes in real time, and then decide if you are going to publish or not. This is the collection of some of the best blog WordPress themes that comes with many advanced and powerful features. Not only that it also includes beautiful designs that let’s you design awesome looking website easily.